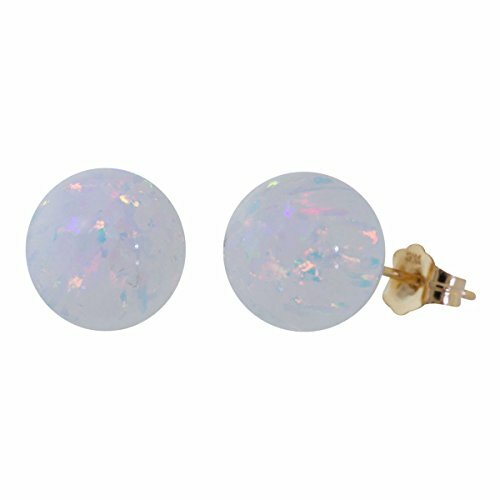 Lorraine: Gorgeous and very hard to find 10mm White Opal Ball Stud Earrings on solid 14K Gold posts. Made with Created White Opal these are a gorgeous addition to any wardrobe and an ideal gift for those with October birth dates. Made with our gorgeous Fiery White Created Opals! Style or Setting: Solid 14k Yellow Gold Cup post for Pierced Ears. Features our bold and stunning 10mm bead or ball size which measures about 4/10 of an inch. Professionally hand-set in our own US studios. If you have any questions about this product by 1000 Jewels, contact us by completing and submitting the form below. If you are looking for a specif part number, please include it with your message.